Below you’ll find the canonical reference for Black Friday email planning. From email examples to specific promotional strategies, we’ve included everything you need to ace your campaign. Like many consumer brands, Patagonia's corporate values include supporting environmental groups. It's one of a handful that focus Black Friday sales on generating donations to its charitable causes. 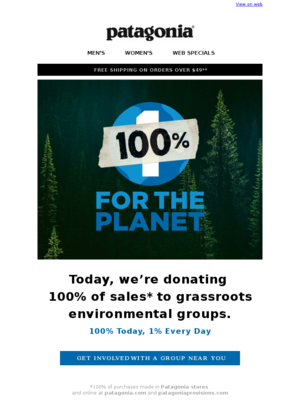 We picked this email because it serves two purposes: furthering the corporate social missions while still making it easy for customers to shop. We picked this email because it has timely content - both subject line and inside content are created to coincide with what’s likely happening in customers’ home right about that time no matter the time zone. Also, we like the prominent placement of the find-a-store function. Considering that customers might be out of town, it helps them find a store in what could be an unfamiliar location. We love the premise for Norwegian Air’s interactive pre-Black Friday email. It’s unique, and the wake-up call request piques curiosity to see just what the brand will send. Plus, it’s great for engagement and brand-building. Just think - your customers are asking you to send them another email. They’re expecting that email. You could send anything from a VIP offer to fun creative content. Genius! If your Black Friday plan calls for sending multiple emails through the day, this is a great one to start with. It acknowledges the time of day (Lucky sent this email at 3:50 a.m. EST on Black Friday) with a clever subject line "Still up? Rebels don't sleep." instead of a bland one like “Black Friday starts now!” and intro copy (“We weren’t asleep either. Let’s do this.”) This stripped-down email gets the job done and gives you room to experiment with different creative content in other emails throughout the day. Imagine someone scrolling through emails in bed just before falling asleep or first thing in the morning and seeing this animation (click the link to see it live). Bam! If the animation doesn't make you want to click through, the "golden ticket" in the offer just below it should. Once again, this email caters to mobile on top and desktop below. 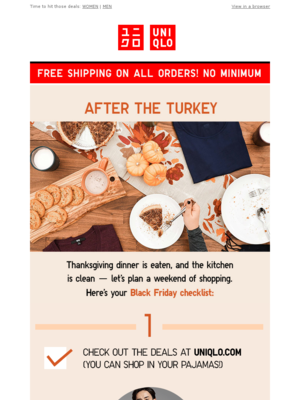 Start planning your Black Friday email strategy with great examples. This DVF email calendar is based on DVF, who sent 1 emails for Black Friday in 2018. This Hurleys email calendar is based on Hurleys UK, who sent 4 emails for Black Friday in 2018. This Bikini.com email calendar is based on Bikini.com, who sent 4 emails for Black Friday in 2018. 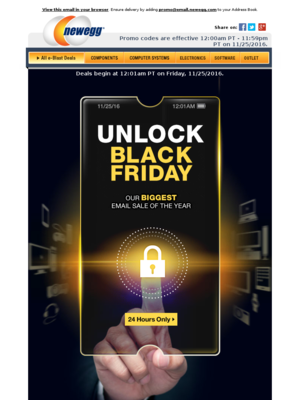 Will you simply send one email on Black Friday or will you send a few emails leading up to it, including a “last chance” email once the event is over? Based on 19228 emails mentioning "black friday" in the subject line. Discover the most popular types of promotions used for Black Friday. Understand how steep a discount companies offer for Black Friday. You can toggle between Dollars Off and Percent Off. 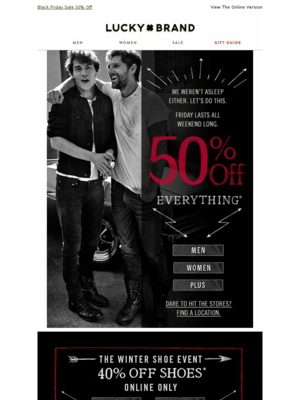 Ace your Black Friday email content with these ready-to-implement strategies. Enjoy! Besides being one of the busiest shopping days of the year, Black Friday also generates one of the heaviest email frequencies. It’s the digital equivalent of the Thanksgiving Day newspaper stuffed to 10 times its usual size with Black Friday ads. Sorting through the slicks is a traditional Turkey Day activity in many households. Will email users take the same time to sort through their inboxes? With open rates hovering around 10% on general promotional emails, marketers can’t assume that their customers will see their emails, let alone choose them over the hundreds or thousands of messages poised to descend on their inboxes. Standing out in the crowd becomes the marketer’s chief creative duty. Pulling in every bit of intelligence from customer data and testing can lay the groundwork. Technology advances and tactics such as interactive emails and message resends can boost engagement, but they won’t move the needle if the message looks like every other email in the inbox. Look for ways to zig when everyone else is zagging. 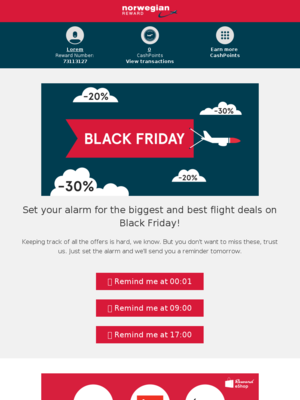 Here are some strategies you can use to make sure your Black Friday emails stand out. How many “Black Friday starts NOW!” subject lines have you seen in your professional career? Your customers know it’s Black Friday. So, tell them something they don’t know. Highlighting your offers or imparting urgency (see next item) uses your precious subject-line-space more effectively. There’s one exception to this rule: “Put the fork down. Black Friday starts right now,” sent by My Publisher. That’s clever. Email frequency by itself isn’t the problem on heavy ecommerce days like Black Friday. Rather, it’s repetitive or irrelevant messaging that turns people off and make your messages invisible in the inbox. If your Black Friday strategy includes weekend-long campaigns, send clearly different offers each day. The Black Friday email you send at 3 a.m. could get buried under an avalanche of competing message in the inbox. Consider resending it later in the day when traffic is lighter, especially if you didn’t get the traction you expected. Resend the original message, but only to those who did not open or act on it the first time. Revise the message and subject line slightly, and send to people who opened and/or clicked but did not convert. Let them know your offer is still good but about to expire. These can be store hours, secondary CTAs and any other information that could drive customers to open. This gives you more space in the subject line to focus on key offers or to get creative.